Slide Fire Solutions, Inc., makes bump stocks, which allows semi-automatic rifles to fire like automatic weapons. There are calls to ban bump stocks after a dozen such devices were found with the gunman who killed 58 people in Las Vegas. A company in the tiny town of Moran, Texas, is facing scrutiny for one of its main products after a gunman opened fire on Las Vegas concert-goers earlier this month. The shooter had semi-automatic rifles fitted with bump stocks, which allowed him to rain down bullets on the crowd like he had fully automatic weapons. Now, congressional leaders are considering regulating or banning bump stocks. That would be a hit to Moran, home to Slide Fire Solutions, a leading maker of the devices. Residents of the small town say it’s scapegoating one of its largest employers, which was sued after the massacre by one of nation's leading gun-control groups. Moran, population 270, is a couple hours west of Fort Worth, 19 miles from the interstate up a winding country highway where bugs the size of hummingbirds thwack against the windshield. 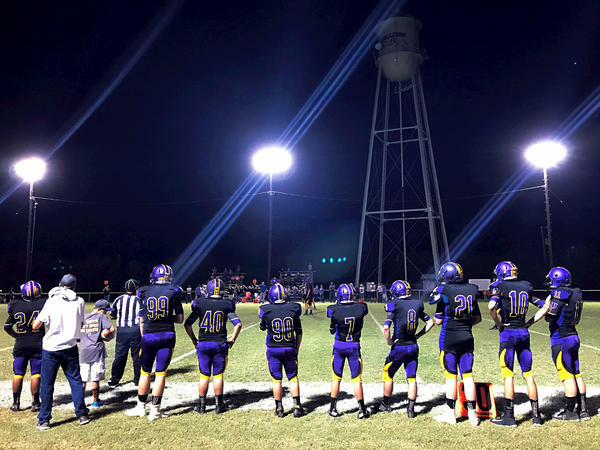 Friday nights here are like Friday nights across rural Texas: Focused on football. The Bulldogs are on the field, the purple on their uniforms reflected on the cheering fans in the bleachers. Six-man football is the game, since there aren’t enough kids to field a full team with 11 players. “It’s a very unique town," Gayle Brown says. "Country, about the best country town I know of. It’s awesome." Brown moved to Moran from Oklahoma 30 years ago and has watched kids and grandkids graduate from the local high school. “You know, our kids grow up here, move away, and they all come back eventually," she says. Jeremiah Cottle, the founder of Slide Fire Solutions, is one of those. After years in the Air Force, Cottle came home to Moran. He invented the bump stock and founded his company here in 2010. Brown says folks here see him as a hometown boy making good in his community. “Yeah, there is a lot of pride, and we are very prideful people here,” she said. 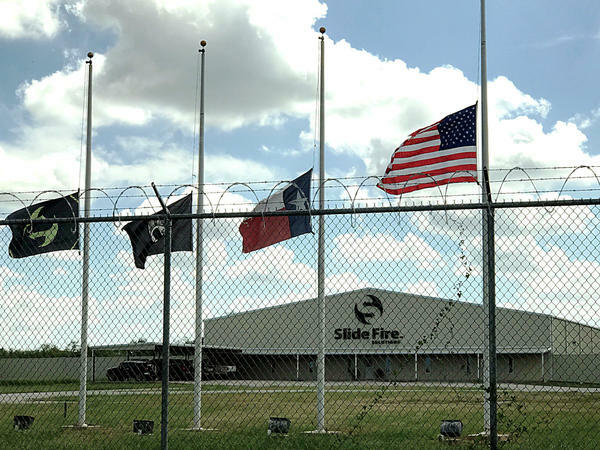 Slide Fire Solutions makes its bump stocks in a big tan metal building just down a farm-to-market road, past the town cemetery. A bump stock replaces the part of the rifle that rests on the shoulder. The device uses energy from the gun’s recoil to bump the trigger back toward the shooters trigger finger over and over quickly, letting fly a continuous stream rapid fire shooting like a fully automatic weapon. Cottle didn’t respond to requests for comment. He told the Albany News in 2011 he created the first bump stock because he couldn’t afford a fully automatic weapon, but wanted the thrill of one. Buying a Slide Fire bump stock and a semi-automatic rifle costs about a tenth of what it costs to buy a heavily regulated and expensive machine gun. When he launched the business out of his home, Cottle didn’t expect the level of demand for his bump stocks. Slide Fire sold more than 35,000 units in the first year, making over $10 million. It’s become part of an industry offering gun enthusiasts after-market upgrades to outfit their weapons. “Here at Slide Fire, it’s always about doing something and pushing it to the edge, giving the people what they’re excited about. And that’s what pushes us to innovate our new products,” Cottle said in a company promotional video. Orders for bump stocks surged after the Las Vegas shooter killed 58 people and injured hundreds. Law enforcement found a dozen rifles outfitted with bump stocks in his hotel room. It's not clear if the gunman used bump stocks made in Moran. Slide Fire stopped taking new orders in order to catch up with the demand. Retailers like Walmart and Cabela stopped selling the devices after the shooting. In the days after the Las Vegas shooting, lawmakers on both sides of the aisle were talking about taking action to curtail the availability of bump stocks, saying the devices seem to circumvent federal restrictions on machine guns. Texas Sen. John Cornyn called on federal regulators to revisit a 2011 determination by the Bureau of Alcohol, Tobacco, Firearms and Explosives that bump stocks don’t fall under existing gun laws. Democratic Sen. Dianne Feinstein has introduced a bill to ban bump stocks entirely. “Regulations aren’t going to do it, and the ATF has said as much to a congressman in a letter a year or so ago. We need a law,” she told Face the Nation. The NRA told The Hill it opposes Feinstein's bill and other bills that would ban bump stocks. In Moran, folks are watching the debate and worrying. Shackelford County Commissioner Lanham Martin, who lives in Moran, has known the Cottle family a long time. They’re one of the oldest families in town, and he used to drink coffee with Jeremiah’s grandfather. Standing in front of the small brick post office, Martin says there’s not much to this tiny town that’s seen better days: Just a bank and a school, a little restaurant and a liquor store. There are more than a few boarded up shops. The post office was even slated to be shut down, Martin said. 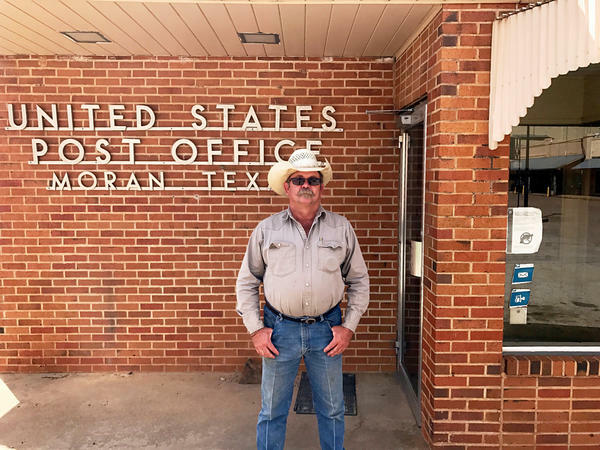 “If it hadn’t been for Slide Fire doing all of their mail order, or a big portion of their mail order, through this post office, we’d have lost our post office,” Martin said. Even now, it closes at noon. As for the current calls to ban bump stocks, he thinks it’s foolish. People are just looking for something or someone to blame for the tragedy in Las Vegas, he said. “It’s just a piece of plastic. It’s a product. It’s not something that if I lay it on the hood of my pickup is going to jump up and try to shoot me,” he said. Back at the football game, that’s a pretty solid majority opinion. Two people quoted the old NRA slogan that guns don’t kill people, people kill people. One man blamed a loss of traditional values for deadly mass shootings. Most people said they just don’t see how banning bump stocks will prevent mass shootings. It wasn’t unanimous, though: One man said he didn’t think bump fire stocks should be legal. A woman worried folks would think ill of Moran residents because of Slide Fire. But most people are just glad that the business exists, like David Brown. “Some of my good friends work out there and they love working out there. It’s a good job and it pays good and that’s hard to find in a little town. So it’s made a big difference around here as far as somewhere to work,” Brown said. Brown is an army veteran. He knows his way around guns and says he owns a Slide Fire bump stock. It’s attached to his AR-15. He shoots for fun, and it’s more fun to shoot more rounds, he says. “It’s like guys that buy a car and go add wheels and add this and add that. To a gun guy, you buy an AR and you add stuff to it. You add a pistol grip, you add a scope, you add a bump fire stock and you accessorize,” he said. Folks in this small town say they’re horrified by what happened in Las Vegas. But that doesn’t mean they think banning bump stocks and shutting down a local business would do much to stop mass shootings in the future.